Join the discussion on our forums! Come discuss Convincing Infiltrator over in our dedicated Convincing Infiltrator discussion topic. Yup, totally cool, nothing suspicious about this guy at all. 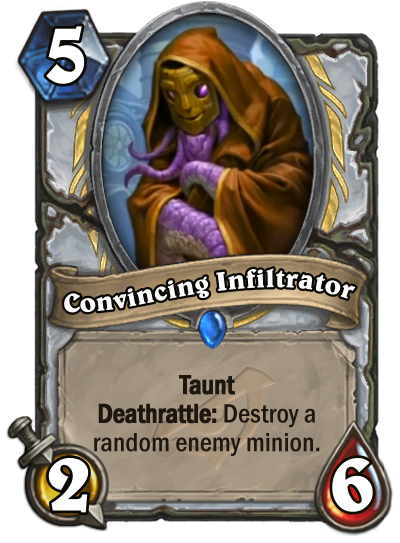 I find it rather amusing that for someone called the "Convincing Infiltrator", this dude's characteristics are completely contradictory to his alleged personality. This guy practically SCREAMS to be noticed (the keyword ain't called "Taunt" for nothing), and when he DOES get taken down, he goes out of his way to screw over some random enemy sap who may or may not have assisted in his demise, implying that unlike the traits of someone with his occupation, he's not exactly someone who prefers going down quietly. Octodad - Loving Father. Caring Husband. Secret Octopus. Good in Arena, little too clunky for Constructed, I think. So cool art. Looks like Dark Souls things or Dagons fishmens from Lovecrafts books. I want Lovecraft reference in flavor text! Looks like it's based off of the d&d/fantasy creature "Worm That Walks".